Noah Dunlap, 16, owns this Sprint car with his father and grandfather. 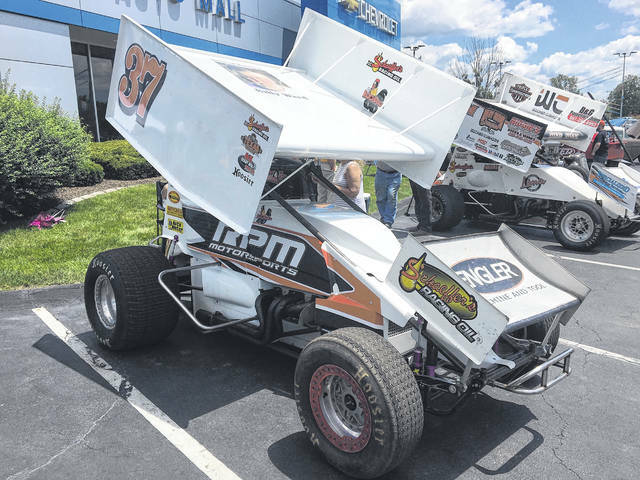 WAPAKONETA — Noah Dunlap, 16, of Wapakoneta, brought his Sprint car to the Westgate Charity Car Show last June. He owns the car with his father and grandfather. Dunlap can be found racing the car at least every other Friday night during the racing season. He races at Limaland and Eldora. “We run 120 mph at Eldora and 90 mph at Limaland,” Dunlap said. The car features a 360-cubic inch engine with 710 horsepower. It runs on alcohol. While Sprint cars aren’t the norm at most car shows, Dunlap’s car attracted young and old alike. It helped that Dunlap stood by his car, answering questions posed by youth and general car enthusiasts. Don’t let Dunlap’s age fool you, as he has years of racing experience. “I started racing at age 12 in Waynesfield,” said Dunlap, who plans to continue racing at Limaland this coming racing season. https://www.limaohio.com/wp-content/uploads/sites/54/2019/02/web1_RealWheels.jpgNoah Dunlap, 16, owns this Sprint car with his father and grandfather.